UPDATE: Learn how you can help at Laura Leigh’s blog. What would you pay for a living, breathing, irreplaceable part of America’s history and heritage in the form of an iconic Mustang? The bidding starts at $125.00 for wild horses such as this 15-year-old Calico mare, Necktag #0832. 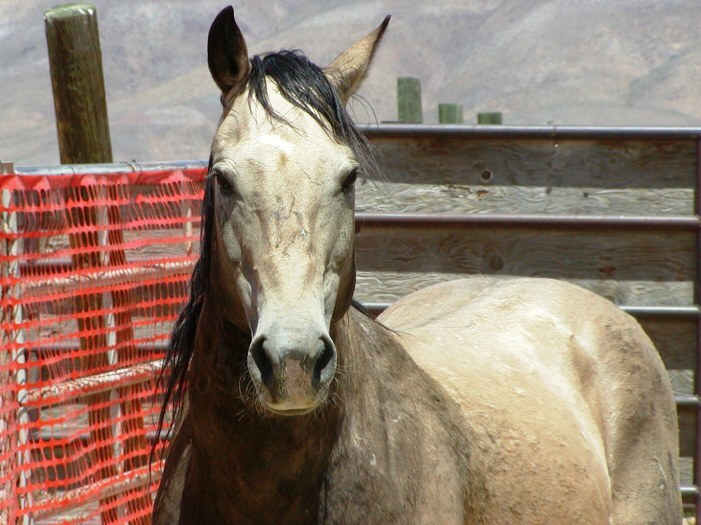 She, and many, many others, are for sale — not adoption — in the Bureau of Land Management (BLM) online wild horse auction. The BLM makes it clear why these horses are for sale to the highest bidder. Under a December 2004 amendment to the 1971 wild horse and burro law, animals more than 10 years old – as well as younger ones that have been passed over for adoption at least three times – are eligible for sale, a transaction in which the title of ownership passes immediately from the Federal government to the buyer. The Purchaser agrees to provide the animal with good care and to not knowingly sell or transfer ownership of any listed wild horse or burro to any person or organization with an intention to resell, trade, or give away the animal for processing into commercial products. “. . . processing into commercial products.” We know what that means. Horse meat. And the BLM are going to enforce this provision how exactly? 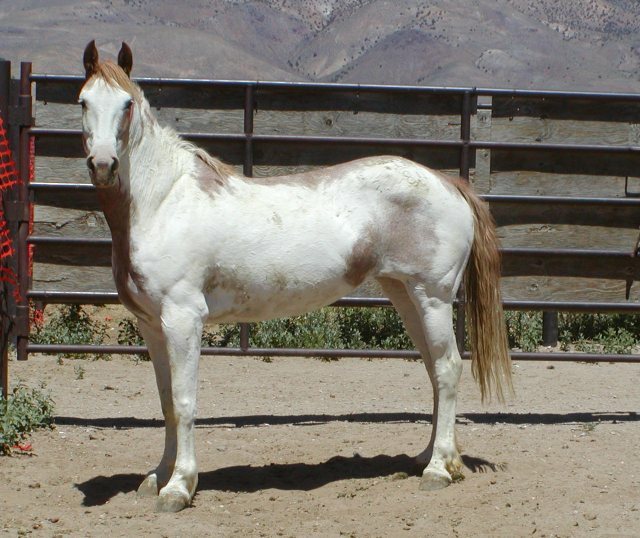 In case you have been wondering what is happening to the Calico Mustangs, here is another for sale. He is a 25-year old buckskin stallion, Necktag #1334. The thought of this magnificent Mustang, at the age of 25, rounded up by helicopter, separated from his herd and family, bought online for $125 by a killer buyer, and going to slaughter for his meat, should send shivers down the spines of any red-blooded, freedom-loving American. Why won’t the BLM simply leave these older horses out on the range to live out their lives in peace? On the BLM auction website, you can scroll through pages of beautiful wild horses being sold to the highest bidder to get them out of long-term holding because of their failed adoption policy. For that you can blame many people. However, this particular episode of the wild horse and burro tragedy started with a couple of unscrupulous U.S. Senators named Burns and Reid. The auction is schedule to last two weeks starting July 14, 2010. Reno, NV (June 21, 2010)—Cindy MacDonald, research expert and American Herds blogger has filed a request for investigation with the Federal Bureau of Investigation (FBI) this afternoon to prevent the transport, adoption, and/or sale of non-excess Calico wild horses currently being held in BLM processing facilities. MacDonald is requesting an investigation into the Bureau of Land Management (BLM) for attempting to dispose of the Calico wild horses prior to confirming that the recent removal operations left approximately 600-900 wild horses on the range as required by law. From December 28, 2009 to February 7, 2010, BLM reported they removed 1922 wild horses from the Calico Complex in NW Nevada during the fatal winter roundup. Early this month, wildlife ecologist Craig Downer carried out a flyover of the Calico Complex in a fixed-wing aircraft. Downer was able to find only 31 wild horses but noted 350 privately-owned cattle grazing on the Herd Management Areas (HMAs). Downer noted that “there was a reasonable spring green-up of the landscape and the open treeless character of the terrain permitted a high degree of horse detection”. An additional ground survey by Robert Bauer resulted in finding only 9 mustangs in Nevada’s Calico Complex region. MacDonald points out that BLM is plagued with failures to properly count free-roaming wild horses and burros even though the agency attempts to develop new protocol to remedy these errors. “While the BLM’s numbers rarely add up, the Calico fiasco is an extreme example of this from start to finish,” states MacDonald. Responding to public comments during last Monday’s BLM Denver workshop, the BLM announced Friday they will partner with U.S. Fish and Wildlife Service for an aerial census of NW Nevada and SE Oregon. The BLM refuses to bring along The Cloud Foundation’s ‘Herd-Watch’ project director, Laura Leigh, on their census flights—continuing to demonstrate their closed-door protocol. The Foundation supports transparency and wants advocates involved in counting horses. The BLM’s policy for massive removals through roundups, followed with stockpiling mustangs in government-contracted holding pens and mid-east pastures is not sustainable and is costing American taxpayers some $40 million per year. “Critic wants FBI probe of BLM horse roundups in NV”, by Scott Sonner, Associated Press Writer, June 22, 2010, posted by the Silicon Valley Mercury News. Adopt a Calico Mustang. Must Act by June 15th. Calico Mare and Foal at Fallon. Image copyright Cat Kindsfather. While efforts to secure the return of the Calico mustangs to their rightful ranges have been unsuccessful to-date, it is still possible to protect the safety of individual horses before they are dispersed to faraway states where they will face lifelong confinement or uncertain fates. To adopt one of the Calico Mountain mustangs seems to be the best that anyone can do for them now. It is with this in mind that photographer and wild horse advocate Cat Kindsfather has made it her personal crusade to document as many of the horses at the BLM’s Fallon, Nevada feedlot as she can, hoping to make their faces and personalities better known to prospective adopters. 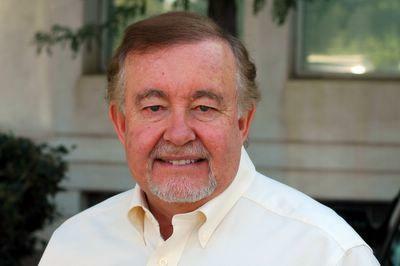 RENO, Nev.—A former U.S. Bureau of Land Management director has endorsed a proposed wild-horse preserve in Nevada, saying it makes more sense than Interior Secretary Ken Salazar’s plan to send mustangs to the Midwest. Jim Baca, who served under President Bill Clinton in 1993 and 1994, said horses should remain in the West to spare the cost of land purchases and leases associated with government-funded, long-term holding facilities in the Midwest. He noted the West has abundant BLM-managed land. 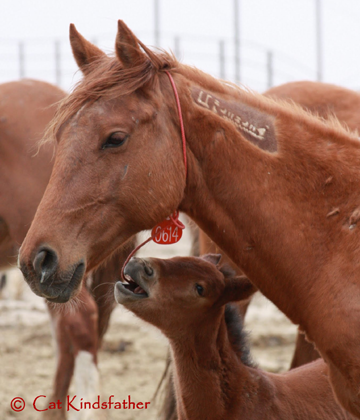 Under the proposal by the horse advocacy group Return to Freedom and the Soldier Meadows Ranch, about 1,700 captive horses would be sent to the ranch for short-term holding before their eventual release back to the range.